Congratulations, you are engaged! Now it's time to spread the news about your pending nuptuals in print. Couples have been putting their wedding announcements in the newspaper long before Facebook took over the world. Having your wedding photograph printed in the newspaper is an honor and still a hot commodity in today's world as a sign of prestige to make it into a newspaper's weddings section, and couples clamor for the opportunity. Wedding announcement are typically a formal write-up published in local or national newspapers that shares the details of your nuptials. The requirements may vary from paper to paper, but the intention is the same for them all: getting your good news out into the world! While you may already know which newspapers you want to print your announcement, it's best to do your research. Maybe you only want to go local -- or just national. Once you've narrowed down your selections, get a list of requirements from the newspapers right away. You need to know the word limit, picture size, deadlines and fees. Different publications also require various details to be included in their announcements, so be informed before you start writing. Not only do you have to provide extensive background information on the newlyweds and their parents, but there are very particular requirements about photographic submissions as well. 1. Select one or two newspapers in your region to which you will submit your wedding information. You'll probably choose a local paper from your hometown and your spouse's (especially if you and your mate's families live in different cities). You might even consider a national newspaper or choose to publish an announcement in your college newsletter. 2. Ask if there is a standard form for you to fill out that will cover the basic details. For many newspapers, all you have to do is submit your information and your announcement will be published, but this is not the case for brides wanting ink in the New York Times - the ultimate wedding annoucement in the Sunday Styles section. 3. Provide relevant details such as your wedding date, location, the bride's maiden name, your parents names and city of residence and where you will live once you are married. 4. Consider including the names and cities of residence of your wedding attendants and where you will go on your honeymoon. 5. Add background information such as where you each grew up, where you went to school and where you now work. 6. Include a daytime and evening phone number in case the editor has any questions or wants more information. 7. Include a photograph with your name and phone number on the back. Ask the paper what size and quality of photograph they prefer. Some accept only black and white, while others will take color. Boston Herald - To receive form, call (617)786-7026 or (800)972-5070. Miami Herald - Contact (305) 350-2111 for submission form. St. Petersburg Times - Wedding forms can be obtained by calling 1-800-333-7505, ext. 8215. Milwaukee Journal Sentinel publishes both engagement and wedding announcements in the classified section and online. They charge $99 for a 5 line ad with color photo plus publication online. Chicago Sun-Times - For instructions to place a wedding announcement call (312)321-2345. The Dallas Morning News - Contact (214) 977-8408 for instructions on how to submit announcement. Sacramento Bee - In addition to using the form online, you can also call (916)321-1326 for more information. San Jose Mercury News - To have a submission form sent to you, call the Celebrations Coordinator at (408) 920-5984, or email celebrations@mercurynews.com. Need more engagement ring inspiration? 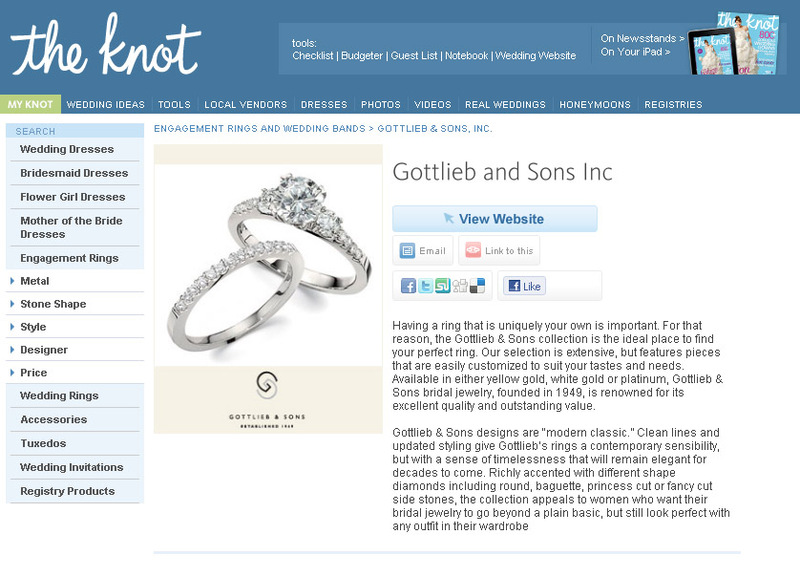 Gottlieb & Sons is now featured online in the Knot's wedding ring gallery. 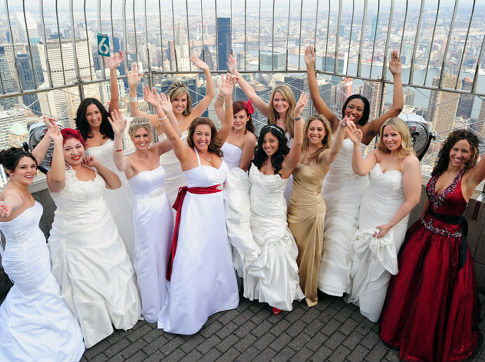 Fourteen couples recently won the chance to have their dream wedding atop one of the most iconic buildings - the Empire State Building from The Knot on Valentine's Day. How are you celebrating your love this Valentine's Day? Trying to save costs on your wedding venue? Some brides are bringing new meaning to "till death do us part" when cutting the bill on their wedding expenses. USA Today spotlighted a new trend among brides looking to keep the price down and the adventure element high for their wedding nuptials. Sompe people, like Paulita Flores, found that hosting a wedding at a funeral home allowed for a less expensive, yet picture perfect setting for her wedding. [via USA Today] Bride Paulita Flores, middle, prepares for her wedding at the Community Life Center in Indianapolis on Dec. 4. "I fell in love (with the center) and thought it was the perfect place," she says. And although people may think it morbid to start a marriage in a place surrounded by sadness, it would be no different than doing it at a church — where both caskets and newlyweds occupy the aisles throughout the year, says Sue Totterdale, national chairwoman of the National Association of Wedding Professionals. "A banquet hall is a banquet hall, and a chapel is a chapel," she says. "If you can get past the driveway and the cemetery, it's going to be beautiful." Would you consider a funeral home wedding? Capturing the essence of glamour, sophistication and rich history of the 1950s and 60s – many brides are reflecting back to the styles of Mad Men for inspiration for their wedding looks. The bride that gravitates towards a retro-style wedding is most Inspired by the timelessness of clean lines, full skirts and spirit of Grace Kelly. She enjoys the elegant attire worn in the boardrooms of Mad Men and the gracefulness of the glamour queens in Hollywood films. 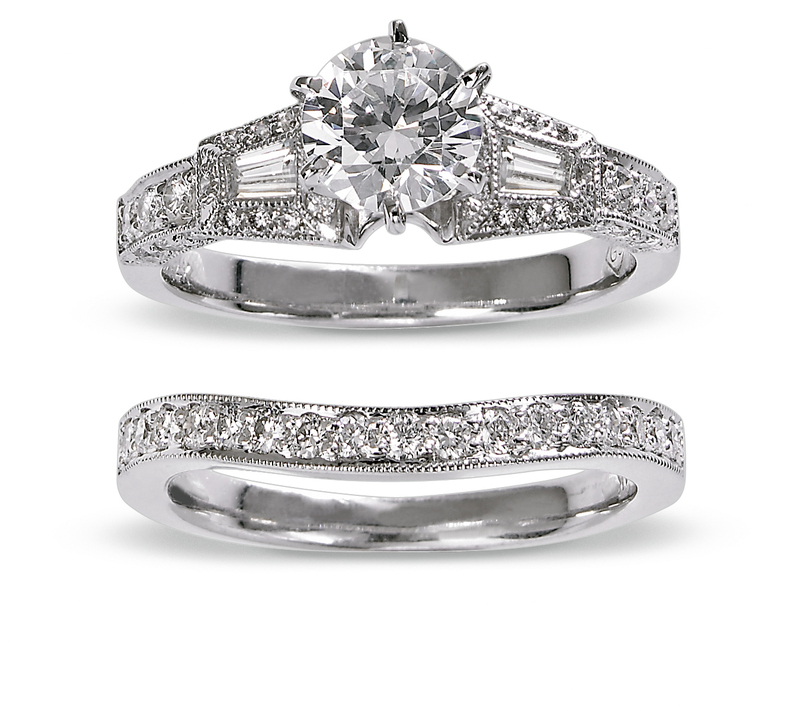 For the ring, think intricate settings with metal and diamond detailing. In addition to the beauty and integrity of the lines, you can be confident that these designs will be timeless. Many dress designers are adapting today’s wedding dresses with retro elements, such as sweetheart necklines, knee-length hemlines and full skirts. For an added element, wear a birdcage veil to continue the theme to the top. 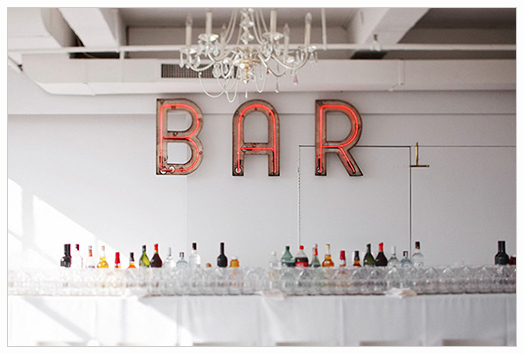 When planning a vintage wedding, the décor and setting will certainly help set the mood. 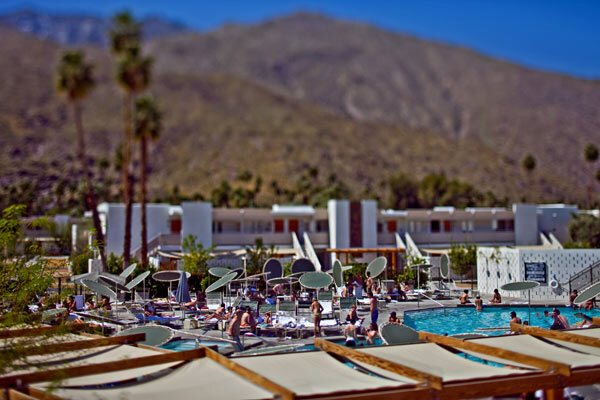 Set your wedding ceremony and reception surrounded by history, such as a restored theater or retro-chic hotel, such as the Ace Hotel in Palm Springs, CA. 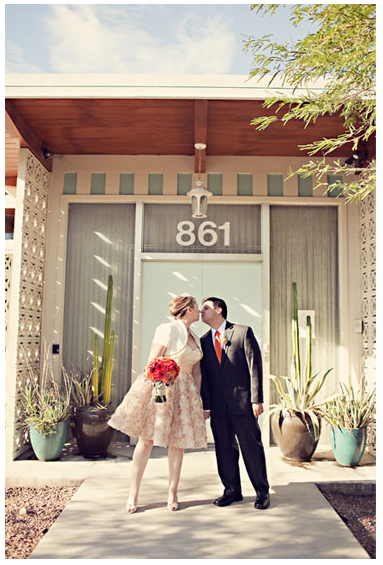 To truly embrace the retro feel, brides should seek out inspiration from local thrift shops or vintage boutiques for 1950/60 era finds. Showcase vintage décor at a bar with 60s era cocktails, like martinis with olives or mint juleps (made with bourbon, mint and sugar). Planning a wedding can often be overwhelming for a newly engaged couple. With the vast amount of vendor information, venue images and bridal attire styles, many may literally feel weighed down by the enormous size of the planning information they collect. However, with the use of smart phones, couples are able to keep track of all of their planning without the use of bulking planning binders. Several wedding industry services have begun to create mobile applications to help couples keep track of vendor info, dress styles and even registry items. Recently, the Wall Street Journal pulled together a list of the top wedding-planning apps and tested their usability, time-saving techniques and user interfaces. Continue reading below to see which apps held up to Wall Street Journal writer, Katherine Boehret’s inspection. The Strength of The Knot - It's nearly impossible to get engaged without quickly growing addicted to TheKnot.com, a one-stop shop for brides and grooms alike. Here, couples can create budgets using a template that estimates cost per item, and they can import guest lists in Excel spreadsheet format. They can also page through photos of other weddings held in their area, or obsessively chat online with other engaged people whose friends are tired of listening to them. Unfortunately, The Knot Inc. doesn't have one mobile app that replicates all of the rich features on its website, though typing http://mobile.theknot.com into the mobile browser on a device like the BlackBerry, iPhone or Android phones opens a condensed version of some features, including the ever-ticking countdown (201 days to go!) and checklists sorted into Category, Date or Reminders. The Knot Wedding Dress Look Book encourages brides to enter personal details to find the best gown. The Knot's iPad app offers a digital magazine version of the popular website and costs $4.99 per issue. The company does offer two free iPhone apps (Android apps are in development) that focus on certain features of the website: The Knot Wedding Dress Look Book and The Knot Wedding 911. The Look Book encourages brides to find just the right wedding gown by entering details about themselves like body type, personality, type of wedding and best physical feature. Wedding 911 includes hundreds of wedding questions that are collected, sorted into eight categories and answered by the site's editor in chief. IPad owners can get their Knot fix by reading a digital magazine with features like videos demonstrating do-it-yourself save-the-date cards. The iPad app itself is free, but the magazine costs $4.99 per issue. Subscriptions aren't available. Get Yourself Registered - Thanks to the iPhone's built-in camera, couples don't need a store's barcode scanner gun to add items to their registries; instead, they can take photos of products' barcodes with their phone to automatically add items to registries. The MyRegistry.com Universal Wishlist With Barcode Scanner ($0.99), WeddingScan ($0.99), Registry Stop (free) and Gift Registry 360 Scan and Add (free) are four such iPhone apps that perform this function. If the barcode photo doesn't work, users can manually type in the product name and take their own photo of it to illustrate. Gift Registry 360's free iPhone app is a personal bridal registry. Users photograph barcodes with their phone cameras to automatically add products to the list. Wedding Planner-Approved - A friend of mine who's a successful wedding planner in North Carolina recommended two apps for the iPhone and iPad: Brides Wedding Genius and My Wedding Concierge. Both are available in free versions, though a $4.99 version of My Wedding Concierge is also available for the iPad. Brides Wedding Genius is a free iPhone app that focuses on dresses, jewelry and travel destinations for a wedding or a honeymoon. Users conduct searches for content by plugging in preferences such as price, style of ring or destination. Results can be starred and saved to a list of favorites. A helpful "Find Online" tab quickly opens each item's website within the app. A $2.99 upgrade will add features and sync the app with BridesWeddingGenius.com. My Wedding Concierge is a self-described inspiration engine, and I tested the full version of this app on my iPad. The home screen of this app offers a large search box and an "Inspire Me!" option below this box. Inspiration comes in the form of suggested wedding blogs, of which there are many, I've discovered since becoming engaged. I like that My Wedding Concierge tries to sort through these blogs to return relevant content, even though some blogs seemed a bit unrelated to my searches. Make Contact - The $9.99 iWedding Deluxe iPhone app works well if you have a lot of people already added as contacts in your iPhone; a shortcut lets you move those contacts over to the app in one step, thus keeping names of transportation companies, photographers, the ceremony officiant and rental companies in one central spot. This app's Home screen shows a countdown clock that measures time down to the second after users input the time of their wedding during setup. A section called The Guide helps locate nearby wedding vendors using GPS and Google Maps. It also lists useful blogs and tips for setting a budget, choosing a ceremony venue and proper etiquette. BlackBerry and Android- I found a handful of wedding planning apps on the Android and BlackBerry platforms, including a $1.99 Android app called MyWeddingBudget and a $2.99 BlackBerry app called Wedding Organizer. But both of these felt rather bare bones and not as intuitive as the iPhone and iPad apps I used. If all else fails, the $0.99 Bridezilla Tamer iPhone app will try to add humor to the situation with lines like, "You're right, it's perfectly reasonable that our cake costs three months' rent because we'll remember how it tasted forever!" Have you downloaded any wedding apps to help with the wedding process?